Choosing between fitness trackers these days is becoming difficult. Simply because there are some really good ones out there and it's no longer all about Fitbit. Fitbit does still lead the charge, but it'll be watching over its shoulder with Garmin, among other companies, hoping to steal its wearable crown. Both have ushered in new fitness trackers this year, with Fitbit unleashing the stylish Alta and Garmin releasing its Vivosmart HR+. One is more feature packed, while the other keeps monitoring activity simple. But which one should you go for? We weigh up the good and the bad about the two trackers to help you decide. Before the Alta, it would be fair to say that Fitbit's trackers lacked that 'wow' factor. So along with the Blaze, the onus is firmly on making something that you'd actually want to wear on a daily basis. The Alta features a small 128 x 36 pixel, 1.4-inch OLED touchscreen and crucially, has removable bands. That gives you the freedom to mix the styles up with a series of official bands on offer. It might not be as slim or as svelte as Jawbone's trackers, but this is one of Fitbit's best looking trackers yet. The Vivosmart HR+ retains the sporty blueprint of its predecessors, but there have been some small design tweaks that help make this Garmin's most attractive wearable to date. The new two-tone finish looks smart and while the small 160 x 68 pixel monochrome screen is not particularly high-res, it's bigger than the one on the Alta and makes it a lot easier to view data. As far as comfort is concerned, we had no problems in our time testing them, and there were none of those skin irritation issues that have blighted some of Fitbit's trackers in the past. If you care about waterproofing, the Vivosmart HR+ is the one for you. It's water resistant to 5ATM (around 50 metres) so you can take it for a dip in the swimming pool. Unfortunately, the same cannot be said for the Alta, which is only sweat, rain and splash proof. When it comes to tracking your day (and night), the Alta keeps things basic in true Fitbit fashion. The three-axis accelerometer will let you track steps, distance, active time and calories burned. It also offers automatic sleep tracking, which is accelerometer-based just as it is on the Vivosmart HR+. There's no altimeter, so you can't track elevation, which is disappointing as climbing stairs is one of the best ways to burn calories. If you're planning to do more than just walk, and want your gym or run sessions to be logged, it'll do that via Fitbit's SmartTrack tech. This can recognise certain activities and log basic activity about them inside the Fitbit app. The Vivosmart HR+ is better equipped for more strenuous workouts. It also offers all the same basic activity tracking and the great Move inactivity bar, which will give you a buzz when you've not been moving around enough. In addition to that it also offers built-in GPS, a heart-rate monitor and an altimeter. The accelerometer also supports tracking for indoor running. All of this extra sensors opens up a host of additional metrics that you're able to record. As far as accuracy is concerned, we had more joy with the Garmin, but even with those additional sensors on board it wasn't perfect. Basic activity and sleep tracking was fine, though we encountered some familiar issues with the heart-rate monitor when training became more intensive. GPS was reliable though and it's something we've become accustomed to with Garmin's wearables. The Alta serves up reliable step count data as well as sleep monitoring, although we had some issues getting the latter to work reliably. While it's great to have masses of data, it's also pointless if you can't make any sense of it when it's time to review the information. When you compare the apps, there's only one winner here and that's Fitbit. It has the more clean, streamlined approach that makes the information easy to digest. Granted, it does pull in a lot less data than the Vivosmart HR+. Where it lacks though is the next step: making sense of the data. Fitbit's new Sleep Schedule marks the first example of the Fitbit app analysing sleep data and trying to introduce changes. It's still pretty basic, but it's a start. Over in Garmin Connect, the Vivosmart HR+'s companion app, things get a bit more busy. You need to spend some time here getting to know what's useful and what's not and where different settings live. Garmin does try to put data into better context with its new Insights feature, but it really takes some time for this to kick in and be considered all that useful. Fitness tracker makers have learned that hardware needs to do more, and adding smartwatch-style features is one way to keep people using their devices. Both models here work as watches, so you can ditch the dumb timepiece if you want to. With the Alta, those features are a little on the basic side. Notifications include basic call, text and calendar notifications to the Alta's display. There's no third-party app support, so no WhatsApp or Facebook updates here. The Alta's built-in vibration motor gives you a buzz and the message, although longer messages do get cut off. Garmin packs in a lot of smartwatch-style support and it's something we've often praised the company for. Vivosmart HR+ included third-party app support to handle all of your phone notifications, plus music control. There are a few extras like support for Garmin's Virb action camera and it also has a 'find my phone' mode. Crucially, it's reliable and offers one of the best smartwatch notification systems outside of the Apple Watch, Pebble and Android Wear. For battery life, the two are level pegged. You'll get a week's use before you need to reach for the charger. The Alta manages five days of tracking but we managed to get eight if you're willing to sacrifice getting buzzed about notifications. Despite all of the additional features on the Vivosmart HR+, it also lives up to its promise of six days' battery life – even with the notifications and sensors in regular use. 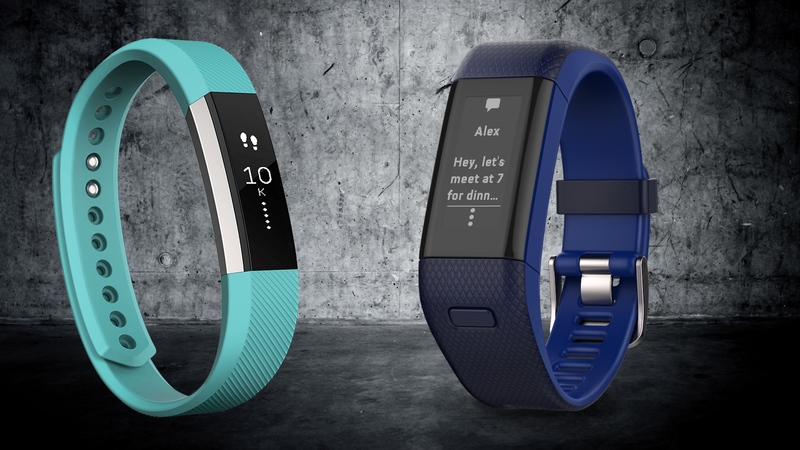 The Fitbit Alta is significantly the cheaper of the two trackers, and is priced in at $125.99, while the Vivosmart HR+ costs $219.99. There's a significant price jump, but for that extra money, you're getting more sensors and data to play with. So which do you go for? The Fitbit Alta or the Vivosmart HR+? If you value basic fitness tracking that's easy to review, then the Alta is the winner for us here. The overall design is a big step from previous Fitbits as well. If you're looking for something that does more than just count steps and an altogether more smartwatch-like experience, the Vivosmart HR+ is the one to go with. Yes, the app still needs to become more user-friendly, but in every other department it beats the Alta. It might not be as svelte or stylish to look at, but it's Garmin's best looking tracker and if you don't mind the sporty nature of the design, then you'll be happy with our current fitness tracker favourite. Do you have any more questions about the Fitbit Alta or the Garmin Vivosmart HR+? Let us know in the comments section below.